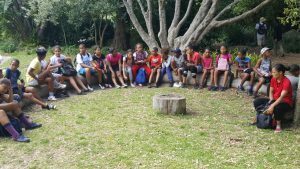 An excited group of 50 kids and their Sunday School teachers from Church of the Reconciliation in Manenberg got to go to Kirstenbosch Gardens for a fun and education hike. The outing organised by “Pride of Table Mountain” and Green Anglicans taught the children about the importance of water, nature and types of historical flowers and tree we find in at the Kirstenbosch Garden. Some of the plants they learned about are: the Protea flowers and how to help it reproduces with the use of controlled fire to release the seeds inside. Fynbos that is mostly found in the Western Cape and Eastern Cape of South Africa and that gives food to the birds and people makes roof for houses with and brooms to sweep the yard, Silver tree are Proteas related trees that can only grow on gravel soil and its way of holding water by opening the silver hair when its raining and then holding the moisture for non-raining days, Alien plantations are the trees that are from other countries and they need to be cut off once they old as they consume about 300L to 400L of water per day which are Gum trees from Australia and the Plum trees from Europe. Indigenous trees are originally from South Africa and its one of the trees in many sepsis that does not consume lots of water and save water. The hike was fun and very educational as during the hikes we would take breaks and sit down to talk about the trees and how they are part of the South African history and the world. The kids had lots of questions and fun during the hike, at one point we had a silent hike to give back to nature and walk peacefully without talking and just listening at the trees and birds sounds in the forest .The messages of conservation, healthy living and biodiversity are clearly communicated and the hike ended up with a Lunch from Woolworths and gave some time for everyone to play games and share about the experience from the hike.